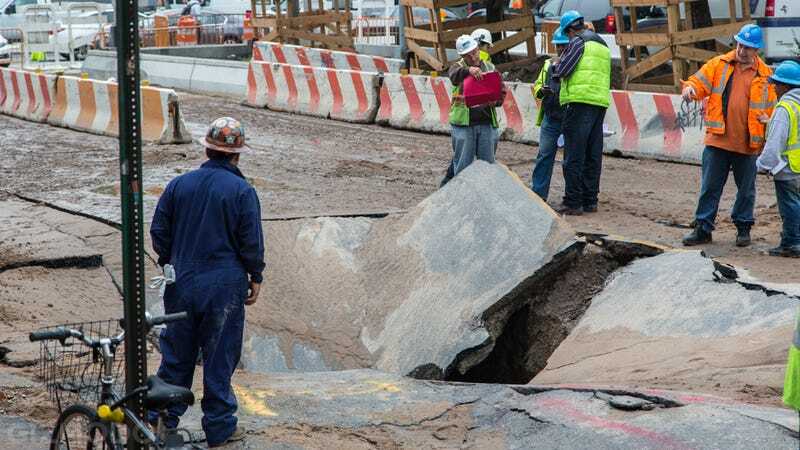 According to a tweet from @NYCityAlerts, a massive sinkhole has just opened up in lower Manhattan. The collapse was preceded by a water main break around 11am, flooding several restaurants including the famed Katz's Deli (don't worry, the pastrami is safe). We went down to check out the scene for ourselves and were told that it will be about a day or more before everything's cleaned up. There is good news, though. The health department has already done an inspection and the leaking water is not a health risk, and while gas lines have temporarily been shut off electric service seems to be unaffected. But perhaps most incredibly, there is purportedly "no effect on the train underneath." If you have any more information or see something we've missed, feel free to drop it down below.